If you need to qualify the data that builds the delimited string such as not including null, you can instead put the statement in an outer apply instead of a select statement. Let’s say you create a web site, and you want to add recaptcha to the aspx page where clients can sign up for an account. Instead of a custom sign up form, you instead use Microsoft’s CreateUserWizard control. I’ll explain how you can use both the CreateUserWizard and recpatcha controls effectively. On the same aspx page that hosts the CreateUserWizard, enter the following in the source for the recaptcha control. lblResult.Text = "Text does not match RECAPTCHA. Please try again." Note: recaptcha.Validate() is a method within the recaptcha.dll that will compare the text entered and the text image. If the recaptcha.isValid = False, setting e.Cancel = True stops the CreateUserWizard from proceeding with creating the user. You also would send the error message to a label you defined on your aspx form stating the RECAPTCHA did not match. 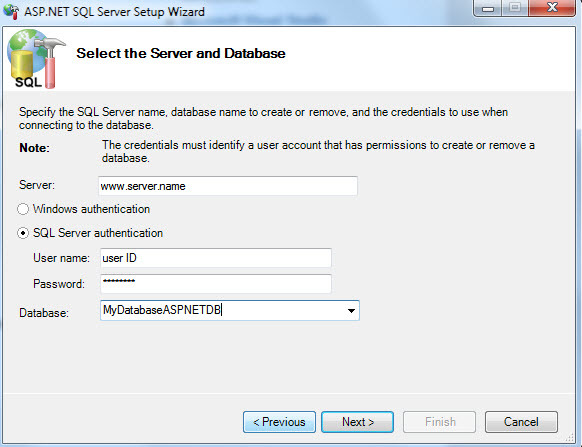 After developing a web site that uses Forms Authentication, you need to create a SQL database that stores the client’s log-in information along with any profiles. The tool that creates the tables in your database that is needed for your application exists on your computer within the .NET Framework. 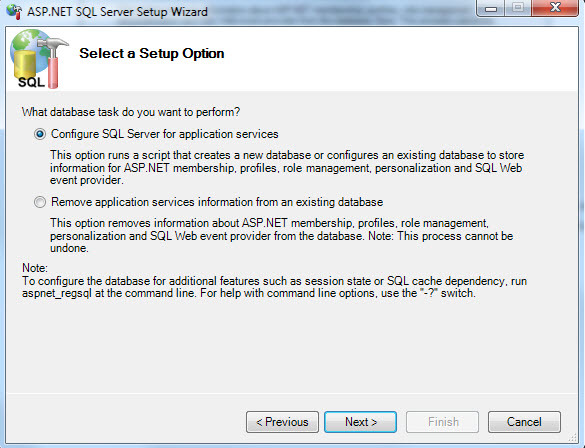 2) Assign and user and password to the Database. 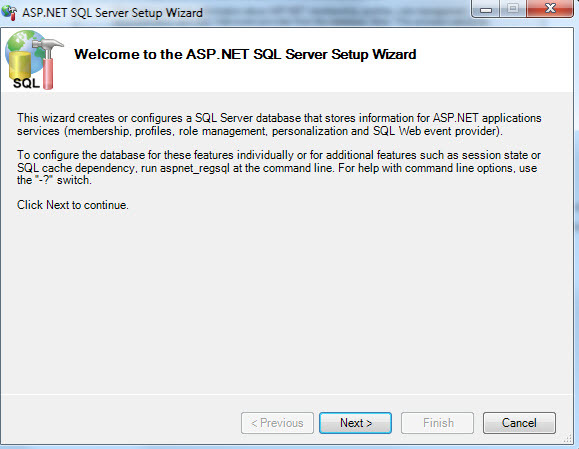 3) Run the ASP.Net SQL Server Setup Wizard located in your .NET Framework directory. The wizard is called aspnet_regsql.exe. 6) Click Next twice. Wait for the wizard to finish. When complete, click Finish. Microsoft Visual Studio 2010 – How to pre-compile your “Web Site” and FTP only portions of your site to your Host. You decided to build a “Web Site” and not a “Web Solution”. You proceed to use the PUBLISH utility in Visual Studio and publish your entire site to your host. You later make a change to your Web Site and discover that using the PUBLISH utility will only publish the entire site all over again. I don’t have to tell YOU why sometimes that causes headaches. What publish does is actually wipe out CLEAN your entire virtual folder. Pre-compile your Web Site and FTP only the updates. Initially publish your Web Site from Visual Studio with the option checked – “Allow this precompiled site to be updatable. This will publish then entire site but also allow you to later “update” the site using the pre-compile feature. 1) Create a new folder on your hard drive that will contain the destination of your pre-compiles. 2) Make a change to your website. Note: Depending on your version of visual studio affects the framework sub folder name. Replace [your web site folder] with the path on your computer where your web site files exist. Replace [your web site precompile folder] with the path on your computer where your pre-compile will be generated after running the pre-compile. 3) Sign on to your favorite FTP and overlay just the dll’s in the bin folder and all your aspx pages. Note: Why aspx pages? Because the pre-compile replaces in the Page declaration of each aspx page, CodeFile=”xxxx.aspx.vb” with inherits=”xxxx_POST, App_Web_??????? ?” In other words, it replaces the name of the vb code behind file with the actual dll it executes.